Hearts’ purple patch is threatening to turn the entire season maroon. 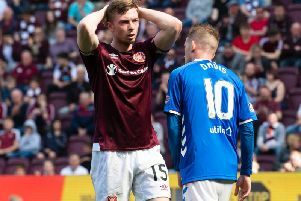 They showed no signs of cracking under the strain of leading the Premier Division and Hearts certainly showed a character and poise which suggested they have no fears of their vaunted position. They had to come back after losing a goal after just five minutes which did little to calm nerves, but the rest of the 90 minutes will certainly have silenced the doubters for the moment. Defensively, Hearts looked weak in the full-back positions and Jerome Vereille took advantage of a mistake by right-back Stephen Frail to have a crack at goal after five minutes. His shot was blocked, but Ally Mitchell picked up the rebound and found Pat Nevin, who drove the ball low into the net to give Kilmarnock the lead. However, it did not take Hearts long to get back on level terms. Stefano Salvatori found space on the right wing and when he floated over a deep cross Stephane Adam rose majestically to head an equaliser after 10 minutes. Both sides were exploiting gaps in each other’s defences in a pulsating opening quarter in which Kilmarnock gave as good as they got. However, Hearts took the lead with a move of sublime interpassing. Neil McCann cut in from the left and passed to Flogel on the edge of the penalty area. With one touch the ball was with Stevie Fulton, with another, it was back with McCann who stormed through the inside left channel and fired the ball into the roof of the net after 27 minutes. Four minutes later, Fulton, who was playing a commanding role for the home side, swung in a corner from the right which was palmed over by Lekovic. But Kilmarnock also threatened. In 35 minutes, a low cross from Gary Holt split the Hearts defence and Mark Roberts can only have been an inch away from making contact. After the break, Kilmarnock were camped inside the Hearts defence, with Nevin in particular, causing them problems. But despite their pressure it was Hearts who increased their lead. Fulton floated over the free kick from the right which was headed back across goal by David Weir for Adam once again to head the ball into the net to give Hearts a 3-1 lead in 61 minutes. Kilmarnock cut the deficit only 60 seconds later. Reilly found Holt just inside the penalty area and he twisted past two defenders before driving the ball into the net. Hearts manager Jim Jefferies tried to stem the flow down the flanks when he moved Fulton to left-back and brought on Jim Hamilton in place of Gary Locke, to shore up the midfield. The tactical switch worked and four minutes after the change Hearts increased their lead. Weir found Flogel free on the right and his pass to Adam’s feet was rewarded when the Frenchman shot the ball into the net in 70 minutes. But once again Kilmarnock clawed their way back. In a goalmouth scramble three minutes later, Weir appeared to catch Vereille as he turned and the referee awarded a penalty from which Roberts scored. The danger of Kilmarnock scoring an equaliser looked very real as they pressed forward but Hearts were able to exploit the gaps they left at the back as they searched for their fourth goal. One minute before the end they sealed victory when substitute John Robertson crossed to Adam, who fed Jose Quitongo at the far post and he slipped the ball into the net to complete the scoring.